You are here: Contests / We're Looking For November's Soldier of the Month! 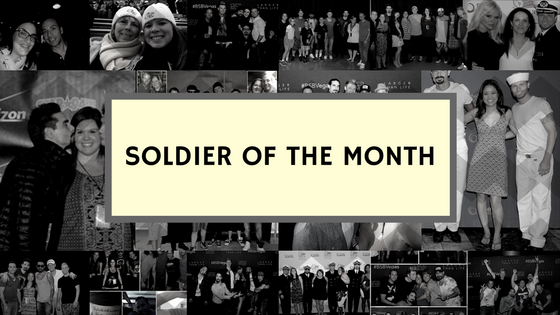 We're looking for one member of the BSB Army to highlight as November's Soldier of the Month. To enter, answer the following question: Why are you thankful for BSB? Did they pick a winner? Is there going to be a December one? I am thankful for BSB because no matter the day I am having I can put on their music and it always cheers me up. Their music brings me back to special memories over the years and brings a smile to my face each and every day. Backstreet Boys concerts are some of the best concert memories I have ever had and attending those concerts has given me the opportunity to meet some great new people as well. Being the November SOTM would be an AMAZING birthday gift! I cannot wait for the new album to be released in January!! I am thankful for BSB because they brought me and my 3 best friends together! I couldn’t imagine not having them in my life. I have three kind, sweet and loving friends that’s I get to share everyday with! We all talk every single day, all day long and have for almost 2 years straight now. Not only do we share the love of the boys but we are truly apart of each other’s lives. We are there for the ups and downs and milestones in each other’s lives! We all don’t live close to each other but we still manage to have strong bonds and plans trips whenever we can! I am just so grateful for being a fan since 1996, staying a fan throughout the years and to have best friends who share the same love for the boys that I do and it only happened because of BSB! I AM SO THANKFUL FOR THE MOST PRECIOUS GIFT OF TRUE FRIENDSHIP... we all know those kind of friendships are hard to come by! Why am I thankful for bsb? So many reason but one reason is they have filled my life with happiness when I thought I wouldn’t see the light again. My father passed away and my world came tumbling down and the other thing that I could do and feel better was pop in a backstreet boy album and I would be in my room singing along and feeling like myself again. I knew as soon as the album was done and I went back out to reality all the pain would still be there BUT I knew I could always have my happy place with bsb!! Also I am a proud mom here because not only am I a huge huge fan but my 12 year old daughter is also a big fan and loves u guys as much as I do! I can’t wait to share the excitement of the DNA album with her!!!! I want to say a big thank u to five of the most amazing men in the world.... Brian,Nick,Kevin,Aj and Howie! BACKSTREET’S BACK ALRIGHT!!! I was only 6 years old when I first heard of the Backstreet Boys, but they obviously had something to make this little girl go crazy about them. When I was 15 years old my Mom went with me to our first Backstreet Boys concert. Little did I know it would be the last one with her. When I was 16 she suddenly passed away. By that time Never Gone was my "hold onto-song". BSB and their music helped me through so much pain! I am thankful for that forever! Now in 2018 I lost my dad aswell. I was and still am devastated! I was in desperate need to see the Backstreet Boys! From one day to another I booked flight, hotel, concert ticket and meet&greet for their Las Vegas Show on November 16th - my 29th birthday. I am usually a happy person, but I was afraid I could not be happy on my birthday this year... But I wanted to be happy! And Brian, AJ, Nick, Kevin and Howie make me happy!! I met the guys for the meet&greet and I felt like I was about to faint. I didnt have the time to tell them what they mean to me, but to get "happy birthday" sang to me and wishes and hugs was so incredible and indescribable! What better way can you celebrate your birthday?! I came all the way from Germany and it was such a short time for such a long trip, but they mean the world to me! I love them so much even though I know they can't remember me or my name. I am thankful for BSB to be able to make inspirational music, my life happier and in hard times help me through it all. I literally grew up with you! I love you Brian, AJ, Nick, Kevin and Howie!! !